The Bourne Conservation Group’s Historical Project had its origins in the group’s scheme to rescue the Old Churchyard and enhance its biodiversity, which started in the Autumn of 2008 (click here). 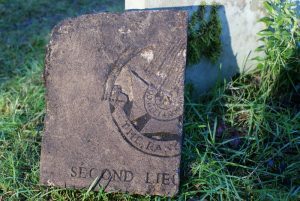 As the Old Churchyard was opened up, memorial stones and unmarked graves were uncovered and we decided to research the history of the site and those who are buried there. 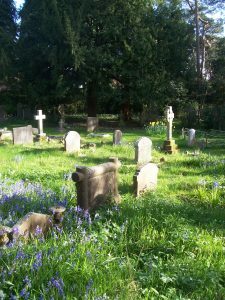 Considerable research into national Census records by one of our members, the late Wendy Maddox, and access to burial records assembled by the Farnham branch of the West Surrey Family History Society enabled the Group to piece together the stories of many of the local families. From here, it was a logical step to widen our research to discover more of the history of the Bourne as it changed from a small semi rural, heath-land community to the residential area that it has become today. One hundred years in The Bourne. Our growing knowledge of the site established that the avenue of (originally) eight lime trees leading up to the north door of the church and the two yew trees at the NE and NW corners of the site were donated by James Knight of Vernon House in Farnham to commemorate the wedding, in 1863, .of the then Prince and Princess of Wales (later King Edward VII and Queen Alexandra). 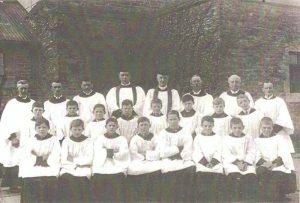 We also discovered that the Revd.Thomas Sidebotham’s ‘ sister, Mary Ann Sidebotham, through the sale of her remarkably successful Children’s Hymnbook, had raised sufficient funds to have the lychgate built in 1888. 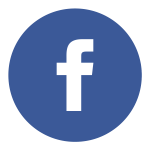 For a brief history of the Children’s Hymnbook click here. In 2014 (the centenary of the outbreak of the First World War) there was particular interest in those who died during the war and are commemorated in the Old Churchyard – Captain Archibald F Raffin MC [Devonshire Rgt. ], Captain John O Slaught [Canadian Infantry] who married the daughter of Farnham Superintendent of Police, was awarded the MC but was killed in France on the day before the 1918.Armistace, Lieutenants Morris and Edward Birkbeck [Indian Army] and Seaman William H Othen RN. There is one registered war grave on site, that of Private Arthur Culver of the Queen’s Royal West Surrey Regiment who was wounded in the Battle of the Somme, brought back to hospital in London but died of his injuries. On his grave is remembered his brother William who was killed later in WWI but is buried where he fell in France. 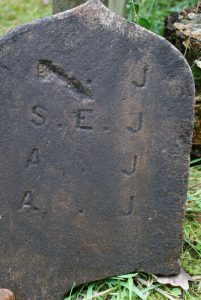 The second picture shows three “footstones”, commonly used to mark the foot of a grave. They may have been removed years ago to simplify grass cutting in OCY. Our aim will be to replace them on the family graves. The story of the above fragment, for which, there is no name or date, is difficult to work out. It appears that it was prepared for a Second Lieutenant. The badge has been identified as that of the 12th (County of London) Battalion of the London Regiment (The Rangers). This was a most interesting unit that took part in the First World War. A gentleman in his nineties, Fred Collins, brought a copy of a photograph of himself in the Church Choir in the 1920s and, at the grave of Flight Lt. Richard Waghorn DFC, a lady told us she had witnessed the 1929 International Schneider Trophy race won by Waghorn, one of the British team flying a Supermarine S6 aircraft designed by R.J. Mitchell as a forerunner to the Spitfire. 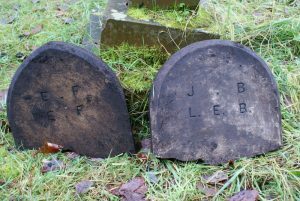 More detail about some of the graves is given in the section on Heritage Open Days (click here). Colonel Montague Wilbraham Taylor, a flamboyant individual, who established a Temperance Hall, on Gravel Hill (the Frensham Road) which is now the local Scout Hut. Patrick Lewis Paget, who inherited Brightwell House from his father-in-law the Rev. 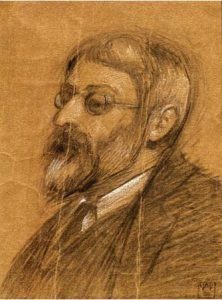 Richard Garth and one of whose daughters was a godchild of Florence Nightingale. Lt. William Russell Steele RN who was accidentally given an overdose of strychnine by Surgeon Lt Veitch while serving on the British V Class destroyer HMS Vancouver. For the reasons already mentioned, our recent research has focused on how and why the Bourne became what it is today. Central to this are the writings of George Sturt. Some idea of the nature of the Bourne in the mid nineteenth century and scale of the changes is given by Sturt (a little dramatically, perhaps), in Change in the Village. Keeping in touch with the local community is very much part of the historical project, both as a way of acquiring fresh information and building up local knowledge of the rich history and ecology of The Bourne. The Group believes that an effective way of maintaining contact with the local community is through active participation in the annual Heritage Open Days programme, organised by the Farnham Society and through other ventures, such as the Farnham Walking Festival, introduced in 2017 for which the Group organised three walks. The Group has also offered talks to local groups on the history, ecology and wildlife of the area, as well providing Members and Friends with a quarterly Newsletter. 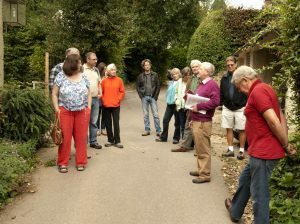 The Group’s first Heritage Open Day was in 2013 with a guided tour of the Old Churchyard and the Old Church Lane area of the Bourne, which is closely associated with George Sturt. Over the following two years we extended the same tour to include additional features such as a visit to the site where the young William Cobbett allegedly played with his two brothers. In 2017 the Committee decided to do something slightly different and, as mentioned above, joined up with staff from SE Water to provide a guided tour explaining the effects that a clean, accessible supply of piped water and a central sewage plant had on the character of the Bourne and its inhabitants, and on the development of the Bourne as a residential area.